Its coloured charts, graphs and bullet-points are supposed to make the most incomprehensible data crystal clear. 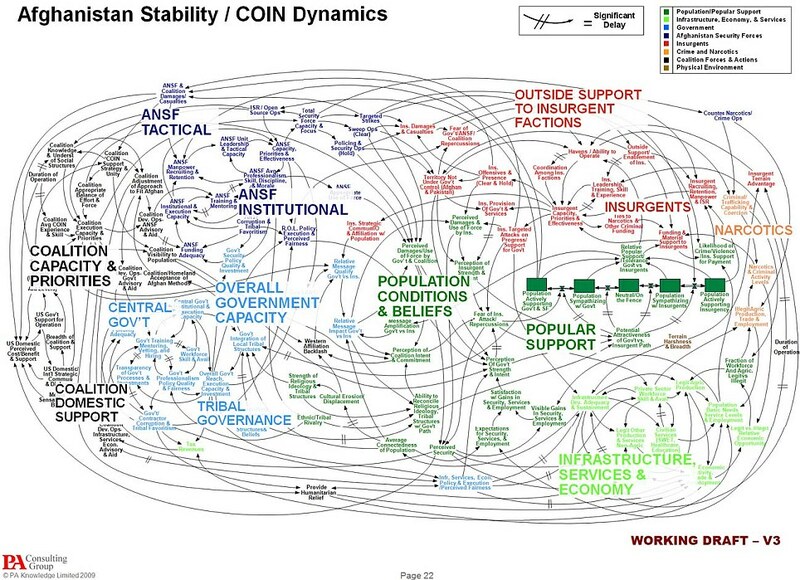 But even the sharpest military minds in American were left baffled by this PowerPoint slide, a mind-boggling attempt to explain the situation in Afghanistan. 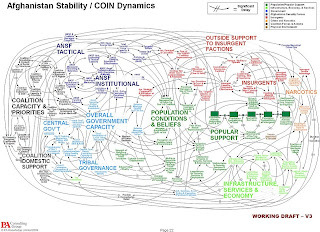 'When we understand that slide, we'll have won the war,' General Stanley McChrystal, the US and NATO force commander, remarked wryly when confronted by the sprawling spaghetti diagram in a briefing. PowerPoint has become public enemy number one for many US officers who find themselves battling slide presentations rather than insurgents. Some have gone as far as to declare all-out war on the software after the military command was over-run with mind-numbing 30-slide presentations. 'PowerPoint makes us stupid,' he growled at a military conference in North Carolina. 'It’s dangerous because it can create the illusion of understanding and the illusion of control,' he told the New York Times. 'Some problems in the world are not bullet-izable. Note that we are implicitly offered two alternatives. On the one hand, we can attempt to synthesize an impossibly large set of disconnected facts in an effort to achieve a nebulous and virtually impossible goal: the command and control of a nation consisting largely of primitive warring religious tribes. On the other hand, recognizing the mind numbing difficulty of such a task, we can abandon any attempt at characterizing any situation (abandon the "illusion of control") and instead, operate by the seat of our pants, i.e., on the basis of whim. I maintain that this instance is nothing but our old friend: rationalism vs. empiricism. Specifically, this whole situation echoes a previous post in which I analyzed Obama's 20 minute diatribe offered as an answer to a simple question. In that post, I claimed that Obama's philosophical pragmatism or his unwillingness and/or inability to think in principle leaves him in the mental state of animal, able only to offer a rambling litany of disconnected concretes. No wonder he is frustrated. But his frustration is not moral or even political. It is epistemological. His mind, like the mind of most modern intellectuals, is wrecked. Without the ability to validly induce general concepts from observation, i.e., without the ability to reason, a man is reduced to the level of an animal. Such an approach would be like attempting to file papers without any categories. So, what are the valid principles involved? Ultimately, we must establish the purpose of our foreign policy. On that basis, one can evaluate facts in a hierarchy and define intermediary goals to reach that end. The goal of America's foreign policy should be the protection and defense of America. To defend America, it might help to first, identify our enemies and second, identify whether these enemies constitute an immediate threat. This would help the military to battle and defeat our enemies rather than software. To do this properly, one must understand and explain the ideology underlying the threat. Once a threat is defined, the goal must be to completely annihilate the enemy. For example, in Gifts from Heaven, The Meaning of the American Victory Over Japan, John Lewis "explains how America targeted, dismantled, and discredited this ideology, replacing it with the ideas, values, and institutions necessary for the establishment of a free society." This is what it looks like when you do not have a clear path to victory. Militaries around the world train for one goal, to defeat their enemy! The military is not a Nation Building tool, it is not a Global Police Force, it is not a Meals on Wheels branch. The Military should be given a clear goal and be left alone to accomplish that goal, just as it was done in WWII. History has shown us that "Mission Creep" will destroy morale and create a situation just as confusing as the PowerPoint slide in this article. "When doing battle, seek a quick victory. A protracted battle will blunt weapons and dampen ardor. If troops lay siege to a walled city, their strength will be exhausted. If the army is exposed to a prolonged campaign, the nation's resources will not suffice. When weapons are blunted, and ardor dampened, strength exhausted, and resources depleted, the neighboring rulers will take advantage of these complications. Then even the wisest of counsels would not be able to avert the consequences that must ensue. Therefore, I have heard of military campaigns that were clumsy but swift, but I have never seen military campaigns that were skilled but protracted. No nation has ever benefited from protracted warfare." These questions and these principles are not heeded for two related reasons. First, modern intellectuals reject the need or possibility of any principles with respect to foreign policy. They urge pragmatism, compromise or appeasement. Second, to assert American interests as the object of our foreign policy would be regarded as "selfish" and "arrogant", predicated on moral certainty of America's superiority - a notion in complete opposition to the Politically Correct precepts of multiculturalism which hold that morality is relative and one can not be sure that freedom and prosperity is preferable to slavery and ignorance. PowerPoint is a software package that can help to simplify and essentialize a complex set of facts and theories. However, like the old adage that "guns don't kill people, people kill people", PowerPoint can not essentialize a disconnected hash of contradictory goals based on the self-sacrificial precepts of altruism and multiculturalism. When our politicians and military leaders understand the need for a principled foreign policy that asserts America's interests clearly and proudly and which proceeds to annihilate our enemies rather than kowtow to them, then and only then we will win the war. I don't understand the question. What is the HC chart?